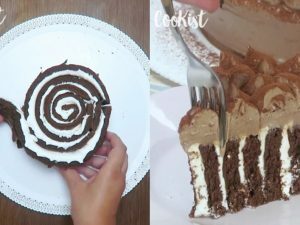 Try this amazing chocolate roll cake. 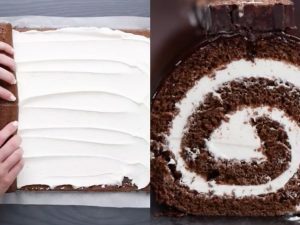 Easy to make and so delicious, the Giant roll cake will the right way to make happy your friend. Ingredients: 1/4 cup cocoa powder; 1/3 cup flour; 1/4 tsp salt; 1 tsp baking powder; 1/2 tsp instant coffee; 4 eggs; 1/2 cup sugar; 1 stick butter; 1/4 cup vegetable shortening, such as Crisco; 7 oz marshmallow fluff, such as Jet Puff; 1 tsp vanilla; 1/4 tsp salt; 1 cup powdered sugar; Dark chocolate, melted; Hostess Swiss Rolls for decoration. 6) When the cake is ready, wait 5 minutes and roll it. Allow the roll to cool completely. 7) Beat together the butter, shortening, vanilla, marshmallow fluff, salt and powdered sugar until smooth. 8) Unroll the cake and spread the filling. 9) Roll again and cover with melted chocolate and snacks.